Here's the seller's detailed description: This is a little seen Yugoslavian/U.S. produced war actioner. The plot concerns this deranged 'Nam vet sergeant Vince Rayner (ANDY WARHOL cult actor JOE DALLESANDRO) who is torturing his own troops because of his own guilt. After he kills a person, he chops off their finger; second victim - 2 fingers, third victim - 3 fingers. And so on. Grim stuff. Well, one of his comrades in arms is out to stop the madness... and is out to get the Sarge. There's also a subplot about high-ranking weapon deals between the U.S. military and organized crime. Directed by FRANK DE PALMA (FUTURE TENSE, TV shows TALES FROM THE DARKSIDE, LAND OF THE LOST, MONSTERS, EARTH 2, CHICAGO HOPE). Starring JOE DALLESANDRO, MARTIN HEWITT, KIMBERLY BECK, REGGIE JOHNSON, GEORGE SHANNON, SAM HENNINGS, B.J. TURNER, ROBERT J. BENNETT, CURT LOWENS, and FRANK ANDRADE. 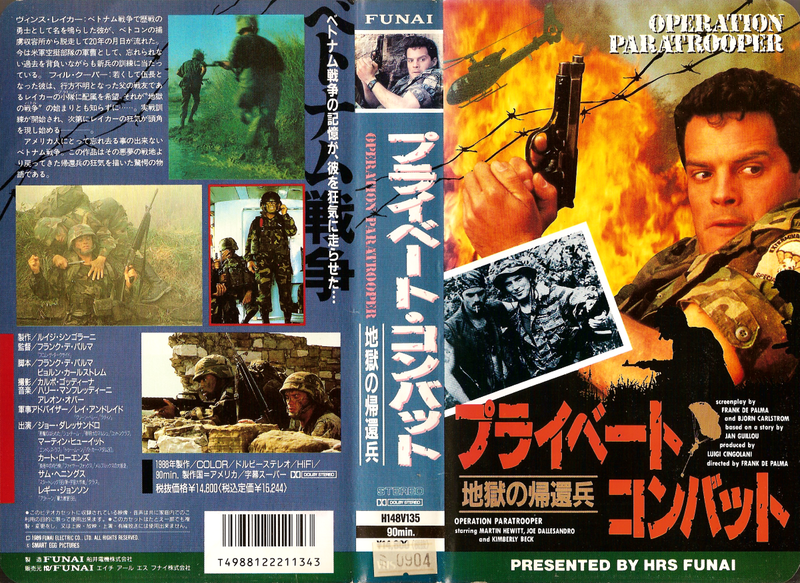 You know, thinking about it, Japan has the biggest catalog of these old budget American gung ho Vietnam actioners on VHS. Even though the U.S. once used the most horrific weapon mankind has ever seen upon them. This movie is kind of a mystery to me. When it was released here in Sweden, the sleeve screamed "BASED ON A STORY BY JAN GUILLOU!". Controversial journalist Guillou is one of Sweden's absolutely most popular novelists. He's the author behind the Agent Hamilton books (played by, among others, Stellan Skarsgård and Peter Stormare in the movie adaptations) and the trilogy about the knight templar, whatever it's called. Google Guillou. I've always wondered when and why he wrote this story. This movie is extremely obscure, but I think it was produced by Smart Egg, a company that besides a few Elm Street movies was involved with some Swedish movies in the '80s.